Located in the City of Elmira, the beautiful historic Eldridge Park has been part of Elmira’s blueprint since 1879 when Dr. Edwin Eldridge had a vision — to bring a world-class Victorian-style park to Elmira so his patients could have a place to exercise. 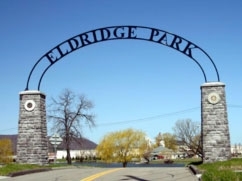 For decades afterward, Eldridge Park was regarded as the beauty spot of the Southern Tier for its colorful flower gardens, picturesque statues, and ponds brimming with local wildlife. Make any family outing more fun with rides, games, and food from our amusement park and fun center in Elmira, New York. Since 1947, Harris Hill has provided children and their parents with a convenient and entertaining place to have family fun. With pay-as-you-go attractions and games and delicious food, there is something for everyone. To save you money, ride tickets are good anytime and do not expire. Tanglewood maintains over ten miles of trails, offers educational programming for children and adults, provides homes in our exhibits for more than 40 native and exotic animals, and welcomes over 35,000 visitors a year. Our local community, Elmira, NY is regarded as the "Soaring Capital of America," in part because of soaring's central role for over 80 years in the social and economic history of the region, attracting individuals and associations from around the world for contests, lectures, symposia, and special events. 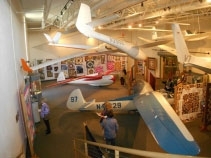 The museum has expanded greatly since opening at their current location in 1978, with an 8,000-square-foot Heritage Hangar, a large archive area and a gift shop which sells many NSM and aviation-related items. Alive After Five is how Elmira kick-starts the weekend! As the largest monthly happy hour and free entertainment celebration, Alive After Five provides a destination for friends and co-workers to gather, unwind, and network while enjoying great live music, tasty beverages and a fun, casual atmosphere. Wisner Market, our signature summer event, is held on Thursdays from 10am until 2pm in Wisner Park. Over 30 vendors offer a variety of products for sale, including fresh produce, cut flowers, candles, art, and crafts. Lunch is served throughout the park during the Market, which features specialties from many well-loved Elmira restaurants. The Christmas House was purchased by Julie and Mark Delgrosso, who continue to operate the business today. Not content to be “just” one of the most photographed buildings in the region, The Christmas House has also won numerous awards for their customer service and product knowledge. 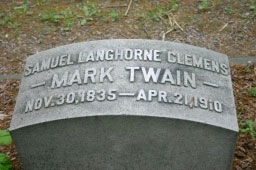 Twain referred to Elmira as “a foretaste of Heaven” and although a citizen of the world, it was here in Elmira he was laid to rest alongside his wife’s family in their plot at Woodlawn Cemetery after his death on April 21, 1910 in Redding, CT. Twain’s grave is marked by a headstone and also a twelve-foot tall granite monument. Visitors to Twain’s grave have been known to leave cigars in his honor. A stone monument was dedicated at the top of the hill on August 29, 1879, the centennial of the Battle of Newtown. The present granite monument was erected in 1912. During the 1930s, Civilian Conservation Corps crews built and developed many of the present facilities of the park, including a beautiful, rustic lodge. In 1973, Newtown Battlefield Reservation was designated as a historic landmark and placed on the National Register of Historic Places. For about a year, Elmira was the site of a prisoner of war camp. The prison camp, in use from July 6, 1864, until July 11, 1865, was dubbed "Hellmira" by its inmates. During those 12 months, 2,970 of the 12,100 prisoners would die from a combination of malnutrition, continued exposure to harsh winter weather, and disease from the poor sanitary conditions on Foster's Pond combined with a lack of medical care. The camp's dead were prepared for burial and laid to rest at what is now Woodlawn National Cemetery.